I admit I was attracted to the hype that the restaurant was opened and operated by ex-convicts. It is a very moving story. 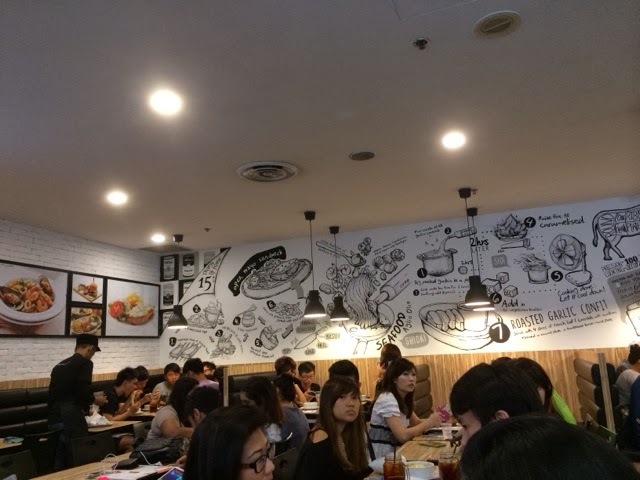 Eighteen Chefs is always crowded during peak hours. We ordered two mains, top up with one set of soup of the day and soft drink at $3.80, and a dessert. The final cost was only $33.05 for two. We ordered those mains with a Chef hat printed beside the dishes on the menu. 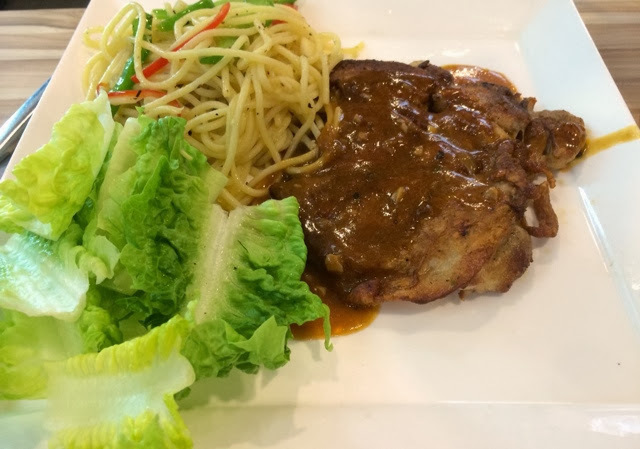 The first one was Aglio Olio spaghetti with mushroom chicken at $12.80. The pasta was definitely too small a serving for a guy but perfect for a lady like me who is on a low carb diet. I suspect their strategy was to encourage diners to order desserts. The chicken tasted tender with crispy skin. It had very strong flavors and salty. It was too salty to eat it on its own. But when you combine it with the pasta which tasted salt less with a hint of fragrant garlic, it was great! The few pieces of lettuce were fresh and crispy. The pasta was fried with capsicum too. I really enjoyed this dish because the sauce had a hint of capers. 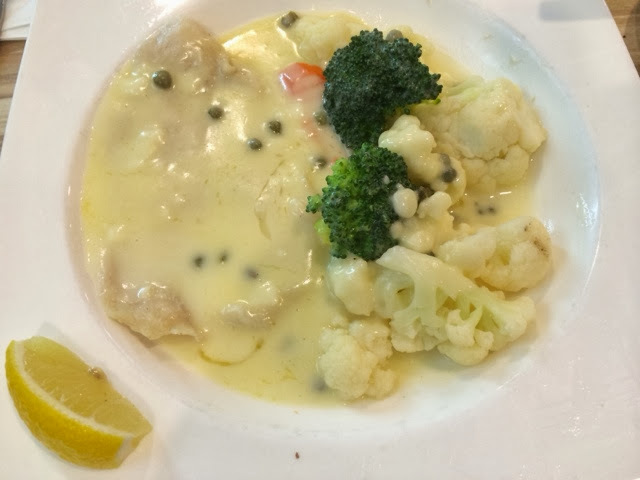 I also like the capers that gave a sharp sour salty taste which went really well with the dory which was soft. The sauce was not overly milky. I am a broccoli and cauliflower lover so I was surprised with their generous portion of vegetables. This dish is great for ladies who are on low carb diets. You can enjoy a good meal without feeling guilty you are wasting the rice, pasta or bread. The soup of the day was Cream of Chicken. It tasted like a good version of Campbell soup loaded with MSG. The redeeming factor was that it was piping hot so it was still quite shiok (satisfying) for a starter. It also had a few small pieces of chicken in it. Despite tasting like Campbell, we finished the soup. Their version was definitely better than Hans. 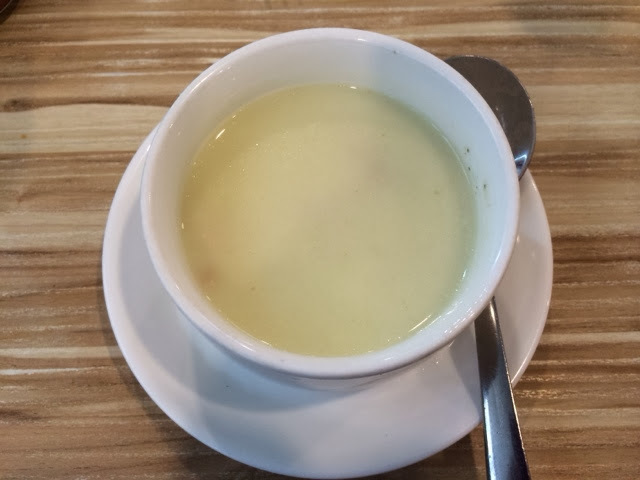 If you are looking for a good quality restaurant standard soup, then don't bother to get the top up. 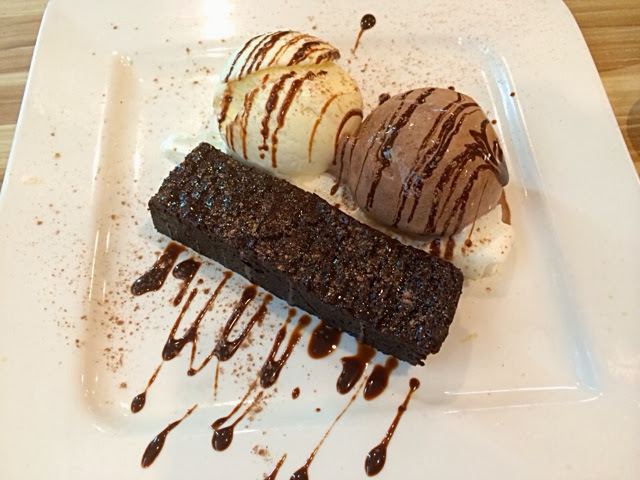 Black Beauty is brownie with ice cream. The brownie has been put in the microwave for too long. It was too hot. It also did not have the usual texture of a brownie, firm. This brownie was too soft for my liking to go with the ice cream. The choco used in the brownie was not the type that would blow you away. I did appreciate it for not being overly sweet. It was very noisy as the tables were arranged very closely like HK style. It was definitely not a place you would want to go for a cosy meet up or share secrets with your pals. The place felt very lively though. The wall paper was interesting as it showed the recipes of some of their dishes. The restaurant was doing well as it was full house. I was quite impressed with the menu because it offered an estimated12 types of munchies, 3 types of platters, 4 types of salads, 11 types of pasta, 5 types of rice dishes, 6 chef selections like fish and chips and steak , 14 types of burgers sandwiches toasts, all day breakfast, 8 sets of kids menu, fried rice dishes, five types of desserts and 4 selections of waffles, 11 types of hot beverages and 19 types of cold beverages. It also has a Be your Own Chef section whereby you can customise your own sauce, pasta and protein. As there is only 7% GST and no service charge, the service was definitely lacking but fair enough. We ordered and paid at the counter. The staff at the counter was polite. The soup and mains were served quickly although it was full house. We waited more than 15 mins for our dessert. We checked with the staff and he or she just nodded but didn't get back to us. We had to check with him or her again. He or she had a "I am really busy" face. We had to get our own condiments, cutlery, napkins, water from a station. The waiters would also not take initiative to clear your table. Most of the staff wear a "I am extremely busy don't disturb me" face. When we left, a waitress thanked us. Young crowd, yuppies, plus bosses that hire ex convicts, chic and good for the soul! Would I return? Yes I would! 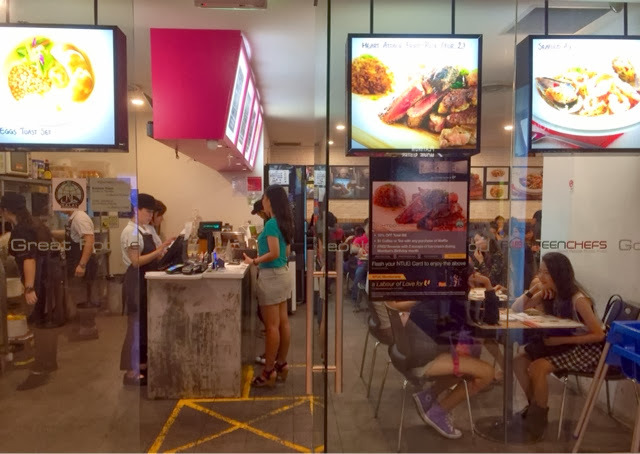 I would return to try their Heart Attack for two which is fried rice with beef steak cut into slices at the side. It is a place whereby I could get a main and a dessert at a very reasonable price.